As the nation’s food scene grows (they said the bubble had to burst but they were wrong), with it comes our insatiable need to out-eat each other. We’ve partnered with Dairy Farmers Thick & Creamy to bring you the 15 dishes you should have eaten to call yourself a foodie, if you’re protecting your badge like it’s a lifejacket on a sinking ship. Hatted since 2010, Cumulus Inc is the never-fail friendly, generous host awaiting in the CBD. 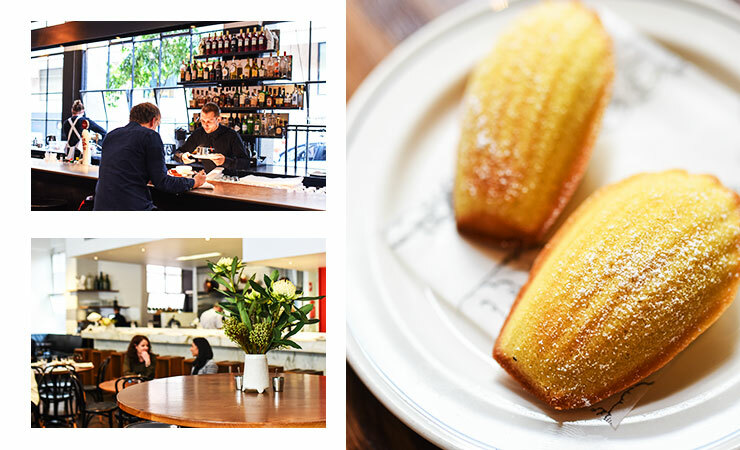 While the all-day menu has many (many) highlights, we can’t go past the freshly baked Madeleines filled with lemon curd. Plump with indulgently rich, tangy lemon curd, 15 minutes is well worth the wait. The name might be simple, but Hector’s Deli’s sandwich is anything but plain. 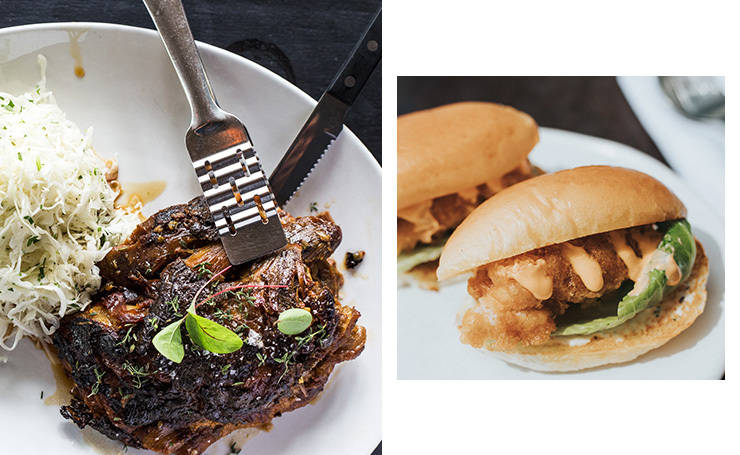 Sandwiched between two country-style, pillow-soft buns is the biggest slab of top quality panko-crumbed fried chicken in Melbourne. 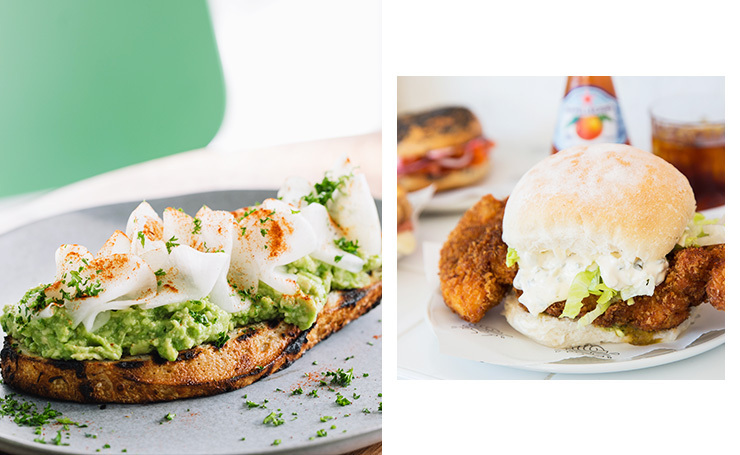 Home of the smashed avo, some of favourite’s include the Avocado & Poached Eggs from Long Story Short and the feta, mint, chilli avo from Monk Bodhi Dharma. Can you go wrong when the restaurant has a giant cheese wheel? No, no you cannot. Half mozzarella bar, half wine bar, Buffalo Dining Club’s Cacio e Pepe is a classically decadent combination salt, pepper, olive oil, parsley and pasta tossed through a pecorino cheese wheel. Pepe Saya crème cheese is slathered on a hand rolled, wood fired bagel before it’s stuffed with pickled mushroom and fried sage. Excuse us, we’re going to go order one now. Served with the best, shoestring French fries around, Hubert’s Prime Beef Tartare uses Wagyu topside and classic condiments for a perfectly executed, no-fuss dish. Lonely Boy won’t be so lonely once you get wind of their fancypants reiteration of the bacon and egg McMuffin (with pickles, naturally). 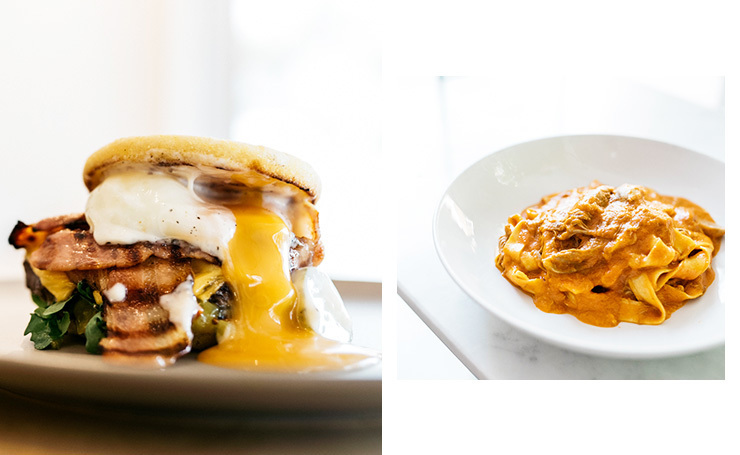 Served with a beef patty, bacon, fried egg, cheese and pickles on a lightly browned English muffin, there’s not much more you could want from a breakfast. Pasta, AKA the ultimate comfort food. Head to Beccofino for your fix and order the Pappardelle al Ragu d’Anatra. The steaming bowl of pasta mixes rich duck and tomato ragu with flat ribbon pasta. Get an Aperol Spritz to wash it down. Toasted jaffles from Fitz + Potts are made daily and served with potato crisps. 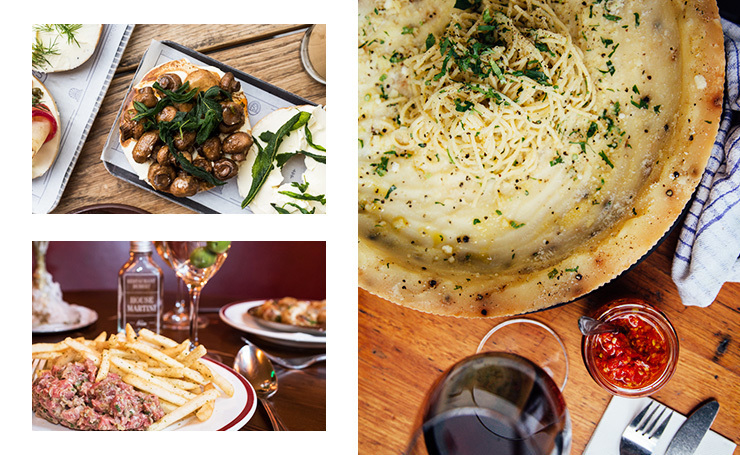 Add N’duja, a spicy pork pate, and forget your troubles at Francoforte Spaghetti Bar. The Porco Rosso a decadent combination of Italian tomato sugo, traditional pork sausage and Grana Padano parmesan. 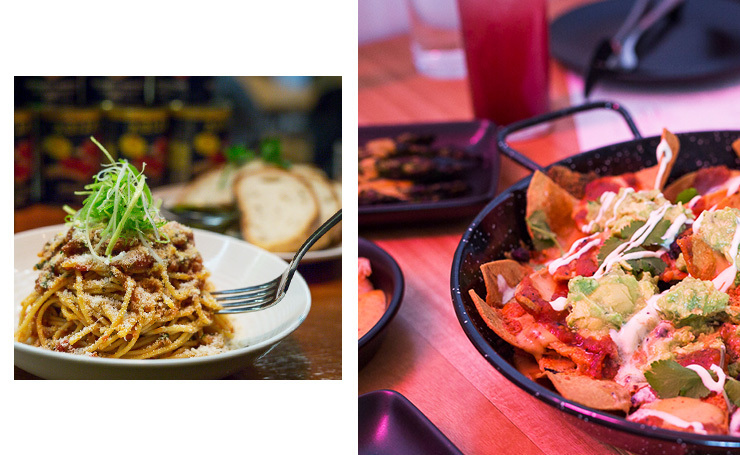 Because who doesn’t like nachos, let alone the perfection from La Vida Urbana? The famous bug roll from Rick Shores is a delicate layer of fried Moreton Bay bug, gem lettuce and sriracha mayo in a soft bun. One for the family (or the whole crew), the boneless salt bush lamb shoulder comes in half kilo or kilo sizes—and when have you ever done something halfway? Slow roasted in sheep’s milk yoghurt and served with lamb jus and cabbage slaw. BYO stretchy pants. 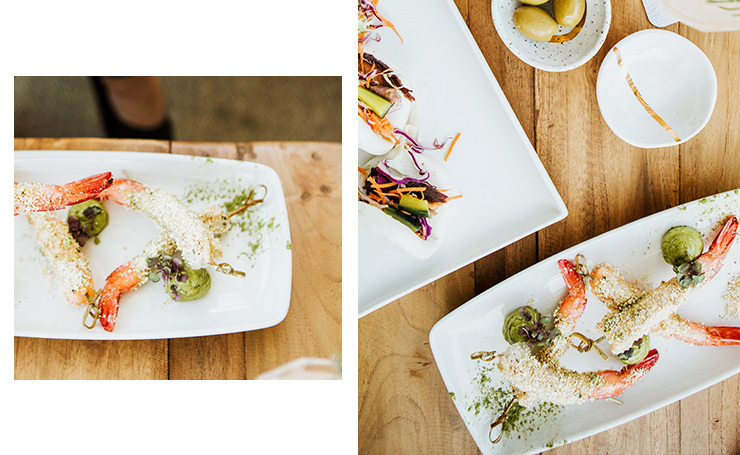 The latest French-inspired bar to hit the Sunshine Coast, Riviera Bar & Lounge’s Mooloolaba Popcorn Prawns served with green tea mayonnaise is a treat. Don’t forget to order a whiskey flight while you’re there. Peanut butter and chocolate in a smoothie, in a bowl. That is all. Tired of eating out a few too many times this week? Trust us, we know the feeling. Why not stay home with a glass of red, your favourite pasta loaded and a indulgent Dairy Farmers Thick & Creamy yoghurt in your favourite flavour? Packed with decadent ingredients including full cream milk, cream and real fruit, they’re generously packed with lashings of flavour. Image credit: Photography for The Urban List.